Being self-employed means you’re responsible for everything in your business, even the mind-numbing stuff you dread. Some days you feel you’ll never make another penny, and others you’re so busy there’s no time to pee. Without a support system in the form of a business community, running a business can feel nearly impossible at times. Trying to “go it alone” probably contributes to this scary statistic: 30% of new businesses fail in the first two years (50% in the first 5 years). It’s easier to call it quits when times are hard if no one is encouraging you to keep going. That’s why terms like biz bestie, mastermind, tribe, and community are so trendy. For a long time, my only support system was my dogs. They were sweet, but they didn’t quite understand my complaints about overdue invoices, complicated tax filings, and soul-sucking projects. Then about 3 years ago, life handed me some nasty lemons, and I knew I needed help turning them into lemonade. That’s when I started my first mastermind group, which met in person every week for more than two years. That was the same time I discovered business-focused Facebook groups, and also when I started having regular virtual coffee chats to expand my network. Creating a business community in these ways saved me from burnout in my business, rescued me from possible depression, and helped me pivot my business (I wouldn’t be living my dream as a business coach now if not for everyone else’s help). I believe so strongly in business community that I created my own for women business owners (join the free group or learn about the paid membership). I encourage all my clients to find their tribes whether it’s one biz bestie, a local networking group, a virtual mastermind, a group coaching program, or a paid membership. It can be hard to find a space that feels right. One where people get you, they’re kind, they listen without judgment, and they make you feel better about business, life, and yourself. Ask for recommendations. The best way to find a community is to ask your friends and business associates. Which communities are they in or have they been part of in the past? Which ones are amazing? Which aren’t? Make sure you ask for specifics about what they did or didn’t love about a community because you may not have the exact same needs. Follow the leader. Who are the authorities you admire? Whose work do you love? Whose messages deeply resonate with you? Do these people have communities? If so, follow them for a while. If your values and personalities mesh well, there’s a good chance you’ll enjoy their groups. Follow the members. 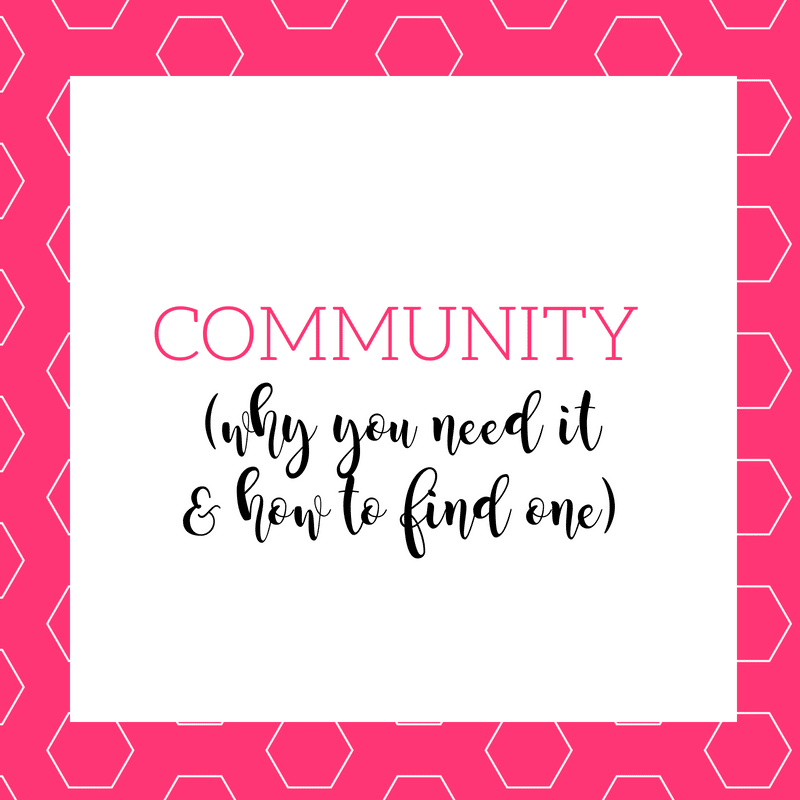 If you hear about a community but don’t personally know anyone in it, how do you decide whether it’s a good fit? One way is to look at the membership and follow a handful of them for a while. Again, if your values and personalities seem similar, there’s a decent chance you’ll like the group. Take a risk. Sometimes you just have to gamble and join a group to see if it’s a fit. In these cases, make sure there’s an option to join on a short-term basis (like month-to-month) so you’re not giving a long-term (like a year) financial or time commitment to something that may not work out. You’re not a unicorn. Diversity is incredibly valuable in a business community, and you’ll want to find a space that provides it. That said, you also don’t want to always feel like the odd-person out, like no one else “gets” you or your business. The right space will make you feel understood by people who do what you do or at least understand it and believe it’s valuable. You share values. You and your tribe should be somewhat aligned in the big, important ways. You don’t necessarily need to have the exact same religious or political beliefs, but you must have mutual respect for what matters most in each other’s lives because, well see #2. You’re not alone. A community is only as strong as its members. If you’re the only person showing up, then it’s not working and it’s not going to help you. The right community has active and engaged members who participate with enthusiasm. You feel safe. Being a business owner is tough. On the days you want to quit or pull out your hair or throw your computer against the wall, you need a place to turn where you can vent and speak your truth without fear. Your tribe should be there to listen, to commiserate, and to give you a hug. You get value. A great support network will help you grow as a business owner. Find a tribe that challenges you to do better and shares resources to help you learn. Oh, and the members should do so without strings attached, not as part of a pitch to get you to buy something. You give value. If you’re in the right community, you’ll give as much as you get. If you’re not lending an ear, answering questions, sharing resources, or in other ways regularly contributing to the other members, you need to find a place where you can. I can check off all 7 of those items in the two groups I turn to for support (my small mastermind group and my Own It Crush It VIP membership community). How about you? Are you getting those needs met by your tribe? If not, it’s time to find a community that’s right for you. I know, I know. LinkedIn is a boring, stuffy site. A real snoozefest. Before you click away from this post, though, let me tell you why I love LinkedIn. Since leaving my 9-to-5 job in 2005, I’ve been running a profitable, sustainable business as a creative. As you know, that’s not easy to do. And you know what’s been the No. 1 reason for my success? For helping me find high-paying clients with very little effort? LinkedIn. That’s right. That boring social site most of us ignore has been responsible for half or more of my income year after year. Best of all, the kinds of clients that come from LinkedIn are typically the ones who have big budgets, are used to spending money, who pay on time, and are open to repeat and retainer work. No, LinkedIn isn’t as fun as Instagram, but it can change your business if you’re willing to invest the time into using it correctly. Like any other tool, LinkedIn only works if you work it. It’s not a magic pill. You can’t just create a profile today and suddenly get $10,000 retainer clients tomorrow. It takes an investment of time. But for those who put in the effort, the rewards can be amazing. Hopefully, I have you interested in learning more. If so, here are three ways to better use LinkedIn to grow your small business. Why do I have so much success with LinkedIn while others don’t? It’s because I have a strategy in place for the platform. Using the site haphazardly won’t deliver results, at least not repeatable ones. Having a plan for LinkedIn starts with a keyword strategy. How would you ideal client search for someone who does what you do? What words or phrases would they search? You may have already gone through this exercise when creating an SEO strategy for your website. That’s great! Just know that you may need to tweak it slightly for LinkedIn, which may have a slightly different audience with different expectations (remember, when people are on LinkedIn they are wearing their professional hats, not their personal ones). Write down 5 to 10 keywords and phrases you want to target for LinkedIn, and then pepper those throughout your profile. Everywhere you have an opportunity to change the language of your profile on LinkedIn, start incorporating these words and phrases. LinkedIn is its own search engine and uses its own algorithm to determine whose names it will return in a search. One deciding factor is keyword density. How many times does “graphic designer,” as an example, show up in a profile? The point isn’t to do “keyword stuffing” Not only does it not boost your name in a search, it will make your profile look ridiculous if someone sees the word “designer” 1,000 times in your short profile. The goal is to use the words naturally throughout your summary, education, experience, and in the content you share (more on that next). Finally, please note that while keywords are important, they aren’t the only determinant in LinkedIn’s algorithm. Other things that also factor into how often you show up in results include how many connections you have and how active you are on the site. As I just mentioned, one of the ways you show up more often in LinkedIn search results is by being active on the site. Like all social media sites, LinkedIn rewards its more active users by making them more visible. How can you be active? One of the best ways to engage with LinkedIn is by sharing content. There are two primary ways to do this. Status updates: Just like you’re used to doing on Facebook, you can share a quick update on LinkedIn. This can be a tip, a question, a quote, a link to a useful article, or sharing your own content. Remember to follow the 80/20 rule. Only a small portion of what you share should be your own material or promotions. Status updates on LinkedIn are short and easy to write. I recommend doing two updates a day (and no more than four). You can use a scheduling tool like Hootsuite or SmarterQueue to plan out a month’s worth of content in an hour or less. Status updates get your name showing up in your connection’s feeds. Even better, if they like it then it shows up in all of their connections’ feeds. Its a quick way to extend your reach on the site. Original articles: LinkedIn has its own publishing platform (called Pulse) where you can write articles. It’s basically microblogging. Share original content here, and don’t stress too much about it. A 500-word piece is fairly common on LinkedIn and that shouldn’t take you too long to create. A warning against copying your blog posts: Google loves to ding anyone who copies content across platforms (the prefer original content for various sites). If you don’t want to hurt your SEO, tweak what you’ve written so it’s different enough to not look like a cut-and-paste job. Also, if the ideal client you’re courting on LinkedIn is different than your blog reader, you may also want to change up the type of content you share on the site. Make sure the content you create makes sense for the audience. Sharing original articles once a week is ideal, but even once a month can make a difference. The goal is to show that you know your industry and that you’re an expert who can be trusted to help your clients. LinkedIn is built on a foundation of connections, and nothing is more important than how many connections you have. The size of your network matters. Connections help determine how often you show up in results. If someone searches for “photographer”, they only see 1st and 2nd connections (the people they know and they people they know). The only way to show up more often is to have more connections. The people who have the most success on LinkedIn are the ones for whom making connections on the site is a knee-jerk reaction. Whenever they meet someone (in person or online), they immediately add them as a connection on LinkedIn. The site isn’t personal like Facebook. The information on LinkedIn is basically what you’d share on a resume and your website. So, if you’d let someone look at those items, why wouldn’t you add them on LinkedIn? You don’t know who someone else has in their connections. Rejecting connections because you don’t know the person may not be the best idea. Not only are you saying no to them, you’re saying no to everyone in their network. If you want to grow your network (and that may mean adding many more people than you actually know personally). If someone ends up being a spammer, it’s easy to remove or block that connection. One last piece of advice: When you make a connection request, make it personal. Don’t use the auto-generated request LinkedIn creates. Customize it by reminding the person how you know each other (if you do) and say something nice about them. That will up the chances of having your request accepted. There you have it. I’ve hopefully convinced you that LinkedIn may be able to help you grow your business, and I’ve shared three things you can start doing right now to start leveraging LinkedIn for lead generation. If you want to learn even more about LinkedIn, take a look at my LinkedIn for Small Business course where I go into much more depth about these (and other) strategies for making the most of the site. I first learned about business-focused Facebook groups in summer of 2015 while listening to the Being Boss podcast. I joined their group when it was just a couple thousand members. Fast forward two years, and that same group closed down after hitting nearly 25,000 members. The number of business groups on Facebook easily tops tens (and maybe hundreds) of thousands. The number that actually achieves critical mass like Being Boss, however, is much smaller. Instead, the bulk of the groups on Facebook are really small—and completely lack engagement. I’m sure you’ve been in one of those groups (and maybe you’re running one) where the only posts seem to come from the group administrator. Outside of those? Crickets. After about a year of debating whether I should start a Facebook group for my business, I finally pulled the trigger in May 2017. At first, I thought I wanted it to grow to Being Boss proportions, with the idea it would give me a giant audience to whom I could sell my mentoring services. The shuttering of several big groups (including Being Boss and Melyssa Griffin’s Online BFFs), however, changed my perspective. About the time my group hit 700 members, I shifted focus from quantity to quality. I realized it was more important to have fewer members who were highly engaged than tons who only spoke up when they had something to promote. My group is small but mighty. I don’t claim to have all the answers, but I’m happy to spill the beans about how I grew my group to 1,500 members in six months and, more importantly, how I maintain a consistent engagement rate of 80+%. Before I officially “launched” the group, I nabbed the custom URL, added the rules/description, and commissioned a logo and cover photo. I came up with a schedule of twice-daily prompts and created attractive graphics. Finally, I wrote an introductory post explaining my goals for the group (a place where women entrepreneurs can turn for advice and support in a positive, judgement-free environment). This meant the group page looked nice and made sense to anyone who was added. 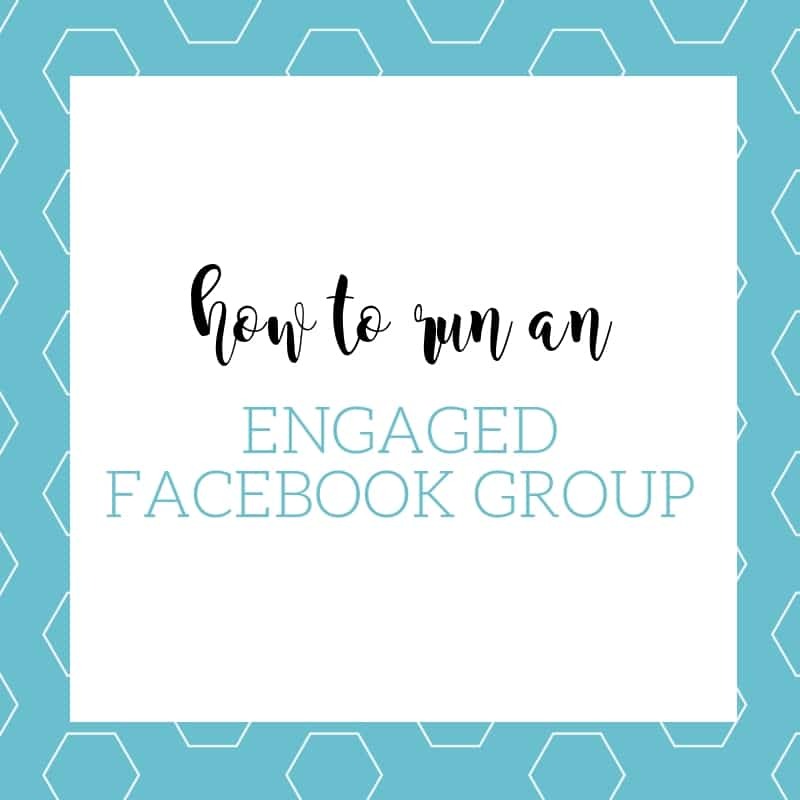 Most people are leery about joining a Facebook group with only a handful of people in it. They figure it won’t be active or worth their time. To combat this problem, I sent personal invitations to Facebook friends who were the target market for the group, and emailed invites to professional acquaintances, not on my friends list. By first reaching out to people who knew, liked, and trusted me, I was able to pre-populate the group with nearly 200 people before I started promoting it. These people served as a “welcome committee” (along with me) to new members I didn’t personally know. When I started the group, I would welcome new members in a weekly post and ask them to introduce themselves. A few would, but most didn’t. It’s what I’d seen other groups do, so I thought that was the best practice. After a month or so, however, I decided to PM each new member instead. I sent a personalized welcome note that encouraged them to introduce themselves and get active in the group. This simple step made a huge difference. So few group admins take the time to send a PM that it made me and my group stand out. And the personal touch made people feel empowered to participate. I want members to know that I’m genuinely grateful they’re part of the group. In the beginning, it’s tempting to want as many members as possible in your group. I made this mistake. I promoted the heck out of the group in other Facebook groups that allowed it, and then accepted everyone who joined. I celebrated each time the group reached a new 100 people. Then, at about 700 people, I realized more isn’t necessarily better. What’s the point of having a ton of members if the group is silent? So, I shifted my focus from “more” to “better.” About that time, Facebook implemented its screening questions for groups. I used, “are you human?” to help me weed out spammers. (If you don’t take the time to type three letters, I doubt you’ll be active in the group.) I also started declining people who were in more than 100 groups. (Someone stretched that thin cannot make my group a priority.) These changes really helped engagement. As the group was more active, members were more excited to invite others in because they knew it was worthwhile. People want to know the person behind the group. After all, we tend to invest (money or time) in people we like, not faceless brands. From the start, I put myself out front and let people get to know me. What’s more, I’m honest about the difficulties of running a business and being a mom. Both in my posts and in occasional live videos, I share my reality, warts and all. I’ve been told time and again by members that they either joined or stayed in the group because they appreciated that genuine approach. Too often, people who run groups try to present a perfect picture of themselves. I think they worry people won’t buy from someone who doesn’t seem to have their stuff together. In my experience, that’s just not true. People respect and respond to authenticity. It’s not enough to start a group, accept a ton of members, schedule a few threads every day, and then walk away. My group works, I think, because I’m present. Every single day, I set aside time to like and comment on members’ posts. I also post outside of the threads to ask questions or share my struggles. You can’t expect others to be engaged if you’re not. There are plenty of infopreneur gurus who will argue this point, but I don’t believe in making my Facebook group part of a sales funnel. I don’t sell, sell, sell to the members at every turn. If I’m asking others to limit their promotions, then I feel like I should do the same thing. And I 100% believe this is why my members love the group so much. They know I genuinely want to see it be a place where people can get help with their businesses. They know it’s not just a sales page masquerading as a business community. As I said, I’m extremely active in my group—I do live Q&As with members, offer live training, answer member questions, share resources, ask questions, and more. Yes, I pitch my services occasionally, but the ration of non-sales to sales activity is probably in the neighborhood of 1,000 to 1. It may not be the formula for raking in the dough (certainly not overnight), but I have my integrity and I’m creating a tribe of like-minded business owners who appreciate my approach. A couple of other random tactics I think have helped engagement. First, every Monday I now call out the most active members from the previous week (I use the new Group Insights to get this information). I give sincere thanks along with a fun .gif. Also, I’ve gone live in the group to encourage members to participate and to let them know I truly believe it’s their group, not mine. I got good feedback, too, for a live I did about the group rules where I asked them to help me keep the group awesome by reporting bad behavior. There you have it. The strategies that have helped my group become one of the coolest corners on the Web. I’d invite you to join the group, but I can’t. I’ve capped membership at 1,500 for the foreseeable future. Why? Because I’m that deadset on keeping it active, engaged, and special. I am doing all I can to prevent it from going the way of Being Boss and Online BFFs. Raise your hand if as a solopreneur you’ve been envious of the media coverage that people like Marie Forelo and Gary Vaynerchuk. I won’t lie. I was completely envious of all of their media attention. It completely validates your business when places like Forbes and Entrepreneur want to feature you and your business. So how does the average solopreneur earn a spot in a coveted publication? Today I’m breaking down the steps you need to take if you want to see your face in those types of publications. When I was a journalist, I saw a huge problem in how much research people did before pitching. Do your homework!Determine which publications would be best suited for your brand. (This needs to be mutually beneficial, but more about that later). Once you have a list, ask yourself these questions for each publication: What topics do they routinely feature? What types of people do they feature? Which journalists write about your niche? Do they have a regular section or column? When pitching a journalist, make sure to include your credentials. I grew up in a doctor’s office (family business), but I’m certainly not qualified to write about medical and health topics. Share your experience so the journalist knows you’re an expert in your field. Maybe you have a ton of education? Maybe you’ve won awards? Maybe you achieve stellar results? Whatever makes you an expert in your field, share it. Also, reference previous articles the journalist has written in your pitch to show you’ve done your homework. Trust me, they’ll love seeing that you took the time to read their work. Email is the best way to reach journalists. Voicemails get lost and, frankly, they don’t have time to listen to them and get back to you. Also, don’t discount social media. Make connections with journalists on Twitter or other social media and build a rapport with them. This will eventually come in handy, I promise. Don’t be discouraged if you don’t make headlines your first go-around. Even if a journalist chooses not to write what you pitch, they’ll save your contact information if they need a source for a future story. Don’t send an email to a journalist and then disappear. If you’re going on vacation, don’t pitch a journalist the day before. Wait until you get back from your trip to make the pitch. Always be sure to include a phone number, email address, and social media channels in your email. If a journalist can’t get ahold of you via your email, they have other means to contact you. This also allows a journalist to check out your social media and website to validate your expert status. Journalists are constantly on tight deadlines, so you want to make working with you easy. Have a media section of your website where they can easily find and download your headshot, logo (both color and black and white), product images, and any other relevant images or information to help with their story. Instead of sending a press release to a journalist who gets 1,000 a day and doesn’t read most or any of them, submit your event-related content to the publication’s free community calendar. When there’s a hole in their publication, journalists look to the community calendar to find anything exciting enough to warrant a story. Also, most papers regularly publish their community calendars online and in print. If you plan far enough ahead, your event could be in the paper for weeks. Also, invite relevant journalists to your events. Sitting at a desk and writing on a deadline is stressful. They love getting out of the office and seeing things in action. Give them a chance to ditch their desk and come enjoy some quality time at your event. Bonus if you have free food available. This one is important. Remember, I said to reach out to journalists via Twitter and not just send a boring press release. If you make connections with journalists, you can offer them exclusives about your business. Just be careful about offering too many exclusives; other journalists you may have a relationship with may feel left out and become less willing to print your news. Be cautious but if done right, you can expect amazing results. Don’t use buzzwords or jargon just because you think they sound cool. Most journalists for local publications are told to keep their writing on a sixth-grade reading level so it’s accessible. Using industry words no one else understands won’t help your case. Save those pieces for industry-specific publications. Keep your pieces human and authentic. Be unique, but don’t oversell your services or event. If you exaggerate your business, you’ll become the boy who cried wolf and no one wants that. We all want to be featured in big-time publications, but don’t be afraid to start locally. The more articles about you, the better. The more backlinks pointing to your website, the easier it is for a journalist to justify featuring you to an editor. Ashley Love is an international award-winning brand strategist and business mentor. She holds a B.A. in English, a B.S. in Political Science, an M.A. in Multimedia Journalism and an M.A. in Public Relations. She’s worked with major nonprofits, politicians, startups, and solopreneurs. She’s a former editor of the lifestyle section of a local newspaper. Now she focuses her attention on helping female entrepreneurs embrace their passions and create a laptop lifestyle. You can find her regularly hanging out in her Facebook group, The Classy CEO. After running my freelance writing business for more than 12 years, which I still do for a select group of corporate clients, I’ve learned quite a lot about the best ways to find work. Freelancing comes with plenty of ups and downs…there are months when you can barely see straight because you’re so busy to weeks when you wonder if you’ll ever work again. When work seems to suddenly dry up, you can panic or pout—or you can take proactive steps to fill your calendar. Today, I want to share five tactics that have always helped me go from slow to swamped. When facing an open stretch on your calendar, shoot an email to your client list. Let them know you’re taking new assignments. This process takes a few minutes and delivers at a high rate. Why shouldn’t it? These people know the quality of your work and realize you have no learning curve. If they have work to give, they’re happy to hand it off to someone they trust and don’t need to train. Make a list of companies you’d like to add to your client list. Research who hires writers at each and see if you find shared connections between you and them on LinkedIn. If so, send an email to the mutual connection and request a warm introduction. Mention your experience in similar industries, and explain that you’re looking to expand your client list. If the contact agrees to an introduction, follow up quickly with the prospect to further explain your qualifications and how you can help him or her. Tap into your network of freelancers, which (hopefully) you’ve been cultivating over time. Email, call, or meet with peers and let them know you’re taking on new projects. Another writer may have too much work and would love to subcontract to you. Or a photographer or graphic designer may have a client who also needs copywriting. There’s real power in collaborating, but you’ll never know what’s out there until you ask. Don’t overlook family and friends. We often forget that everyone (even our own cousins or high­ school classmates) are also working professionals with vast networks of their own. Post about your search for new clients on Facebook, LinkedIn, and other social networks. Or, if a public outcry feels needy, send a polite email to those you trust. Networking is vital for growing a business. In the old days, networking for self-employed folks meant driving to a local Chamber of Commerce for glad-handing with a big group of muckety mucks, or hitting a coffee shop for a one-one-one sesh with a peer. If you lived in a small town, you were basically out of luck. Even in larger cities, it usually didn’t take long before you started seeing the same people over and over again at networking events. How limiting. No more! Today, you can use the Internet to meet face-to-face with other creatives anywhere in the world. These “virtual coffee chats” can take place any time of day and you don’t even have to put on real pants to do them! Wondering if virtual coffee chats have value? Not sure how to get started? Nervous about actually doing them? No worries. Read on for my tips on how to do them. This year I’ve really concentrated on expanding my network and visibility, and virtual coffee dates have been a big part of my strategy. Here are some tips I’ve discovered to help you get started with virtual coffee dates, and to make them work for your business. This post contains affiliate links. If you purchase via a link here, I’ll get a commission. The price is the same for you whether you use my link or buy directly from the vendor. 1. Peers: I don’t care who you are, what you do, or what stage your business is in, we can all use a more people in our lives who “get” what we do. Your family and friends likely try to be supportive of your business, but very often they don’t really understand what you do, how you do it, or why it can be so hard sometimes. Virtual coffee chats with others in the online creative space give you an opportunity to talk about all those things with someone who truly understands. They can simply be a sympathetic ear, or they can provide really useful advice based on their own experiences. Both are super valuable. 2. Collaborators: You may not even realize it yet, but there are probably a ton of ways you could partner up with someone else and create something magical—guest blogging, joint-venture webinars, co-writing an ebook or course, co-hosting a podcast, etc. But how will you ever know or find the right partner in crime if you work alone and never get to know other creatives? Virtual coffee dates allow you to discover who is (and who definitely IS NOT) a great complement to you and your business. 3. Cheerleaders: Want to grow your business faster? It helps to have other people in your corner, spreading the message about your product or service. People are far more likely to support and endorse a person than a business, and that’s why it’s important that people get to know you. The more people who know and like you, the more people you’ll have in your corner when you need help telling your story far and wide. 4. Clients: This is last for a reason. Yes, there’s always the chance your networking efforts will bring in new clients, but that shouldn’t be your primary motivation. If it is, you’ll likely give off a used-car salesman vibe that no one likes. Go into every networking encounter with a goal of giving more than you get, and I promise it will eventually pay dividends. Now that you’re convinced you should be doing more networking, you may be wondering how to find virtual coffee dates. Start by deciding who you want to meet. What types of professionals make the most sense to serve as cheerleaders, collaborators, and confidantes? Which industries are most compatible with yours? Which personalities best align with yours? Are there any specific influencers or leaders on your wish list? Next, think about ways to find and reach those people. If it’s someone specific, visit her website and see if she has a link for scheduling coffee chats (many people, like myself, do). If not, send her an email and ask for one. You may be surprised by how many people are open to the idea. If you don’t have specific names yet, turn to social media for help. Reach out to appropriate people via Facebook groups, Instagram, Twitter, etc. Send them a direct message asking if they’re open to having a coffee chat. Again, you’ll likely get more yeses than nos, especially if you’re clear that it’s not a sales pitch. If you don’t yet have an online calendaring system (I use and love Acuity), it’s time to get one. You can stick to the free version, but it’s much simpler to arrange these dates when you can send someone a link to your calendar and let them find a time that fits their schedule. It’s possible to do virtual coffee chats via phone, but I highly recommend using a video service like Skype, Zoom, or Google Hangouts. It’s impossible to zone out or multitask when someone is watching you, and video makes the conversation far more personal and meaningful. Before virtual coffee chat, do some research on the person you’ll be meeting. Visit her website and/or social media channels to learn a bit about what she does and to find some common ground. This will help you develop talking points for the conversation. Armed with some knowledge about your date, you can going into the call with a few prepared questions to avoid awkward silences. Don’t be afraid to take control of the conversation from the start. If you arranged the call, it’s really your responsibility to guide it anyway. And don’t make the conversation about you, put the spotlight on her. Listen to what she says, and ask plenty of follow-up questions. Before the call ends, however, make sure you’ve shared your elevator pitch so she knows what you do and how she can help. Finally, never end a virtual coffee chat without asking this powerful question: “How can I help your business?” I got this advice from the amazing Reina Pomeroy and have used it ever since. She also advises making sure you are prepared to answer the same question. Do you need a launch cheerleader? Do you need advice? Do you want referrals? Whatever your ask, don’t pass up this opportunity to get this person’s help. Your coffee chat doesn’t end when you hang up the phone. Afterward, make sure you deliver on any promises you made. If you said you’d help with X, Y, or Z, then do it promptly. Also, always follow-up a chat with an email thanking the person for her time and reiterating a few things you learned about her and her business. Tell her how she can connect with you online and encourage her to stay in touch and keep you informed about anything new in her business. Finally, check back in with her from time to time. Your virtual coffee chats should mark the beginning (not the end) of a relationship. Circle back to everyone in your network periodically to see how they are doing and to tell them about developments in your own business. Follow these tips and I’m certain you’ll not only have some of the best chats of your professional life, you’ll also see how virtual coffee dates can help your business move to the next level.